Policy making in a country like Bangladesh is not an easy task, a meaningful policy position is impossible without serious efforts from the policy makers to involve stakeholders; secondly, it is necessery to involve various groups and organisation active through empirical reserach or programmes that government wishes to address. Without a meaningful base of empirical reseach and participation of relevant stakeholders, a policy document could hardly be of any value. If policy makers ignore these very basic essentialities policy documents are reduced into statements related to few projects, lacking conceptual clarity and coherence with blurred or misplaced objectives. A recent report of Women and Children Affairs Ministry is no exception. This year (May 2014) the Ministry of Women and Children Affairs, Government of the People’s Republic of Bangladesh has submitted the Bangladesh Report on ‘ The Implementation of the Beijing Declaration and Platform for Action (1995) and the outcomes of the Twenty-third Special Session of the General Assembly (2000)’. It touches upon the 12 issues of the Platform of Action; section 11 is on Women and Environment covering some issues of environmental degradation and mostly those of climate change. It points out that climate change and human made environmental degradation has seriously threatened the country’s resource and livelihood base of its vast population. The effects of climate change and environmental degradation include water stress, sea level rise and increased extreme weather events, adverse effect on food security, water and air pollution, salinity, climate induced migration and health problems. Women being the principal resource managers at the household level are the worst victims of resource stress and depletion and increased natural calamities. However, in the three pages of the 65 page report, there are many ignored issues that affect both environment and women in a very serious way. It is disappointing to see how the environmental issues are reduced to few project related activities formulated with weak perception on environment. However, we cannot just blame the government for such negligence, the women’s groups also miserably failed to make environment, biodiversity and climate change as focus of attention for understanding the situation of women in the country. 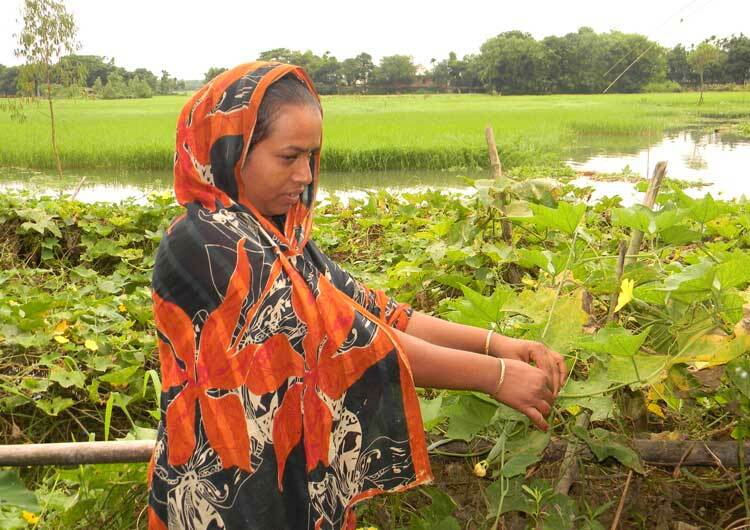 Although mainstreaming of gender in policies and plans of environment and climate change mitigation and adaptation was recognized, there was hardly any participation of women’s groups in the Bangladesh Climate Change Strategy & Action Plan, (BCCSAP) 2009, Draft National Environment Policy 2013, Forestry Sector (Amendment) Rules 2009 and Bangladesh Water Policy (1999), which apparently have incorporated women’s roles and benefits in relevant policies and plans. The Climate Change and Gender Action Plan (ccGAP) 2013 was developed considering gender as a crosscutting element. The narrow gender perspective of climate change is based on vulnerabilities of disasters such as flood, cyclones, drought, salinity etc. particularly for those living in the coastal areas. It does not question the sources of carbon emission that is related to industrial food production, unplanned industrialisation and urbanisation. In an unequal situation for women in the society, climate change related disasters have gender specific impacts with different magnitudes on women. The rural and urban women are affected differently. It is acknowledged in various international studies that the negative effects of climate change affect women the most because they depend on natural resources and the environment for all their activities and the basic needs of their families. For Bangladesh, it is no different. Despite such established facts, the policies and plans on gender specific climate change hardly reflect such understanding. The Review Report points out that women’s participation in mitigation is mainly through low carbon generating activities such as renewable energy like solar power, Improved cooking stoves (ICS) and bio-gas, waste management, which were mainly initiated for livelihood support, environmental protection, increasing access to energy or for poverty reduction, making women responsible for causing carbon emission. Incorporating women in the climate change resilient infrastructures is proposed in the development projects for coastal region. This is perhaps the least important factor in the climate change mitigation programmes. It is a very disappointing proposition indeed for such a crucial issue faced by women. The funniest part of the environment section is the merging of food security and infrastructure. The food security program is nothing but making women the target group for low gestation and low water consuming products and short gestation fisheries. These are certainly not the agricultural “products” that will solve the food security issues. It is very surprising to see that for food security, the report does not mention agricultural crops, but mentions “products”. How can food security be achieved without production of food crops? In the Women and economy section of the same report, it shows the highest number of women (68.84%) is engaged in agriculture sector followed by service sector (21.89%) and industry sector (13.32%). The report remarks that ‘new agricultural technologies have increased the demand for female labour. The adoption of high yielding varieties of crop production has increased workload not only in the fields but also in crop processing activities. It is mainly the women from landless of near landless households who work as wage labour. Men are also moving out of agriculture, either migrating to urban areas/abroad or taking up non-agriculture related activities, with increasing productivity and returns from involvement in non-agricultural sectors’. The agricultural policy does not recognise women’s contribution and their needs in the agricultural work. It is driven by commercial and corporate interest thereby introducing technologies and corporate controlled seeds and agricultural equipment making women’s work harder and also have displacing impact. The introduction of genetically modified seeds (GMOs) is a threat for environment, health and biodiversity, thereby posing a big threat for women. Unfortunately, the section on Women and environment does not see how environment is destroyed through use of chemicals such as pesticides and chemicals and ground water for irrigation and also threatens food security. Now the major issue related to food is that of safety, because of contamination of pesticides and chemicals at the time of production and use of harmful chemical preservatives in the processing of crops, fruits, meat, milk, fish etc. The threat of unsafe food has challenged the notion of food security. While we have food security (showing high productivity), the food safety is not ensured. That is, the food is unsafe for consumption. In the report, women’s involvement in social forestry programme is given as an example of protection of the forests. Women are engaged in tree plantation under different tree-cover expansion projects. But what kind of trees are they planting? Which trees they are protecting? There is no mention of that. 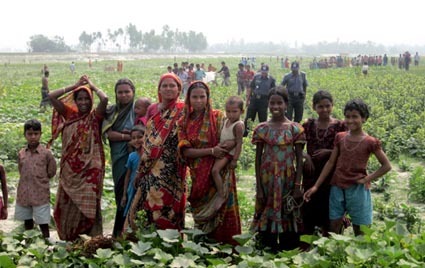 The report says in June 2012 25% of total 500,000 participants in social forestry were women. They are mostly engaged in the maintenance of the infrastructure. They are not part of the decision making of the tree plantation scheme. What about deforestation practices through tobacco cultivation in different parts of Bangladesh specially in the Hill Tracts? Why there is no mention of denudation of the Hills in the Chittagong Hills Tracts and reforestation with commercial timber trees negatively affecting the lives of the indigenous people, particularly those of women? As a challenge, the report says that the world including Bangladesh will gradually move into the path of green growth, explore green jobs and technology. Women’s participation and adequate share into this green economy would be a challenge. What role women are going to play in the green growth. It is time for women to challenge such notions, which are just new ways of exploiting the nature. Women in Bangladesh face various environmental and ecological threats that are hardly addressed by the government policy makers. Gender issues are only taken into consideration as part of the projects on Climate change, social forestry etc. in which women are only given more responsibilities to act as if they are the ones to create such environmental problems. The women’s organisations have also failed to raise the most important issue as a concern which affects the majority of the women living in the rural areas. The majority of the women are engaged in agriculture. They are involved in crop production, seed keeping, post harvest works, fish processing, poultry and cow-goat raising activities. These activities did not get any recognition in the national accounting; on the contrary the agricultural sector plans and policies are technology and chemical oriented, which affects women’s work and cause environmental destruction. However, even on small scale there are some positive actions undertaken by Nayakrishi Andolon which organises women in over 300,000 farming communities on preservation of biodiversity, seed keeping and resisting against harmful introduction of genetically modified seeds. Women’s network on biodiversity is also active in 54 districts involving grass roots women’s organisations to protect environment and preserve biodiversity. These actions may help to create examples of government policies and actions beyond Beijing plus 20 and in the formulation of the Sustainable Development Goals. Let’s not keep quiet on this very important issue that affects our survival. Our relation to nature is key to the sustainability of the planet. Let’s not disturb but protect nature.